The Preschool Development Grant (PDG) is forging a long-term impact on the quality of Pre-K instruction. Coaching, an important component of early learning, is the featured topic for this March issue of the PDG TA’s newsletter. 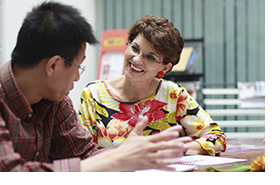 While there are many approaches to teacher professional development, from large national conferences to local communities of learners, classroom-based coaching is one strategy focused exclusively on improving teacher’s instructional proficiency. Although coaching is a common form of professional development, not all coaching is the same. Variables such as the purpose or focus of the coaching sessions, frequency of coaching sessions, and the overall goal of coaching can vary significantly. PDG’s emphasis on developing and expanding high-quality education places instructional quality at the forefront. Across PDG sub-grantees, coaching not only provides individualized guidance to heighten instructional effectiveness, it also supports educational leaders as they strive to improve program quality. Please let us know if there is a topic that you would like to learn more about by contacting PDGTA@aemcorp.com. We hope you find the information in this newsletter helpful in your work. Alabama’s Office of School Readiness developed the Alabama Reflective Coaching Model (ARC) using the characteristics related to how people learn including building on prior knowledge, interacting with the learner in a nonjudgmental way and building on the strengths of the learner. The model supports mutual trust and respect where the coach holds the professional judgment of the teacher in high regard. The model was developed for use with early childhood coaches and Alabama First Class Pre-K Directors, Lead Teachers, Auxiliary Teachers and support personnel. The goals of Practice Based professional development and reflective coaching are to build collaborative relationships, solve specific problems, and learn new skills while refining existing skills. The Alabama Reflective Coaching Model was originally designed to give Alabama First Class Pre-K teachers the support and skills they need in order to provide a high-quality environment that supports school readiness. The characteristics related to coaching include the use of shared planning between the learner and coach, observations by and of the learner, participatory action on the part of the learner, promoting the learner’s reflection on his or her actions, and feedback by the coach on the learner’s reflections. Preschool Development Grant (PDG) funding has expanded the Reflective Coaching Model’s reach to over 100 additional classrooms or nearly 2,000 more pre-kindergarten children. Coaches provide tiered coaching with each classroom receiving at least one visit each month with a ratio of one Coach for every 15 classrooms. The use of data, gathered from a robust PDG-funded software system, allows teachers to benefit from teacher-coach designed plans of action that rely less on the Coach’s opinion and are more about assessment findings. Several assessment tools are used to view classroom quality and children’s achievement including Early Childhood Environment Rating Scale-Revised (ECERS-R), Classroom Assessment Scoring System (CLASS), Teaching Strategies GOLD, and Peabody Picture Vocabulary Test (PPVT). This approach is part of Alabama’s pre-kindergarten strategic plan for staffing and allows the state’s leadership to answer a wide range of research questions related to their quality initiatives and, specifically, coaching and monitoring, ultimately informing quality enhancement efforts for birth through grade 3. Mentoring and coaching are increasingly seen as key strategies for supporting teachers at any stage of their careers, and for improving teacher practice (Institute of Medicine and National Research Council, 2015). Both are relationship-based, adult learning strategies intended to promote and support an educator’s awareness and refinement of his or her professional learning process and classroom effectiveness. While the terms “mentoring” and “coaching” are often used interchangeably, there can be significant distinctions between these two roles. Mentors tend to focus on the development of an individual teacher, and goals for the mentoring process are typically agreed upon mutually between the mentor and teacher with whom she works—although mentoring relationships may differ, depending on the structure and intention of the particular mentoring program. In contrast, coaches may work either with individuals or with classroom teams as a group, and/or may have a set agenda for classroom improvement. Often, however, the distinctions between mentoring and coaching become blurred in practice. Mentoring and coaching are both practical and supportive ways to support teacher learning and growth on the job. Ideally, mentors and coaches are skilled in the craft of teaching, creative in problem-solving, keenly observant, able to reflect on their practice, and flexible in relating to other adults. Like the teachers with whom they work, they should be receptive to learning new information about the process of teaching, and willing to take risks in order to grow. Mentors and coaches serve as guides and role models who talk openly and directly with teachers about their work, help them improve their skills in interacting with children and families, and provide information and feedback. Ideally they should have significant experience in teaching young children, with a command of relevant skills and knowledge to share with their protégés about pedagogy and how children learn. Preparation for either role should include education and training not only in child development, and the care and teaching of young children, but also in adult learning, culture, teacher development and reflective practice. Typically coaching and mentoring take place within the context of a formal program, however, teachers can form mentoring or coaching relationships on their own, perhaps with a trusted director or other colleague. But neither coaching or mentoring is the same as supervision. Supervisors can be pedagogical leaders for teachers, and they can apply many of the strategies used by coaches and mentors. But a supervisor also has roles and responsibilities that interfere with a purely mentoring or coaching relationship—namely, the authority to fire, promote and make other decisions about a person’s job status and livelihood. Mentors often do some assessment and evaluation of teachers, but not in a way that is linked to the protégé’s continued employment. The primary role of a mentor or coach is to provide support and encouragement so that a teacher has someone to rely on and turn to. Trust is essential for a close relationship, along with willingness by both partners to reveal themselves and to risk making mistakes. The goals and structures of a mentoring or coaching program can have implications for responsibilities of mentors and coaches, including who the teachers are, and why they are participating. This chart below looks at a number of ways in which these programs can differ. Institute of Medicine and National Research Council (2015). Transforming the workforce for children birth through age 8: A unifying foundation. Washington, DC: The National Academies Press. Whitebook, M & Bellm, D. (2013). Supporting teachers as learners: A guide for mentors and coaches in early care and education. Washington, DC: American Federation of Teachers. There are many successful coaching models that benefit early childhood professionals. Two coaching models, described below, are being used by early childhood programs with evidence of positive outcomes. Each has a strong research base and offers professional development to support users’ implementation. 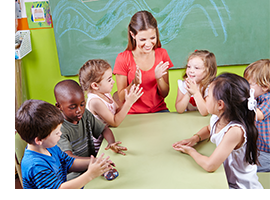 Practice-Based Coaching (PBC): The Head Start community has adopted Practice-Based Coaching (PBC) developed by the National Center on Quality Teaching and Learning (NCQTL). PBC is a cyclical process that uses three components to support teachers’ practices with children to result in positive outcomes. The three components are: 1) Planning goals and action steps; 2) Engaging in focused observation; and 3) Reflecting on and sharing feedback about teaching practices. You can find more information about Practice-Based Coaching here. 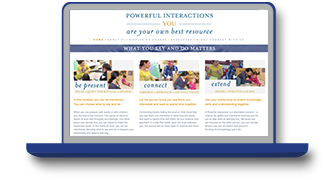 Powerful Interactions: Powerful Interactions is a coaching model that evolved from Amy Laura Dombro, Judy Jablon, and Charlotte Stetson’s work on helping teachers observe children in a meaningful way. They had been helping teachers focus on connecting with children to extend their learning when they realized that the next step was to support teachers in their work to make a difference in children’s lives. Dombro and Jablon, with Shaun Johnsen, developed Coaching with Powerful Interactions: A Guide for Partnering with Early Childhood Teachers. The authors tell us that “Powerful Interactions coaches: observe for and highlights teachers' competence; use observations and articulation to promote intentionality; value individualizing to develop trusting relationships; promote a mutual learning partnership; and support teachers by modeling what to say and do and how.” Visit the site for more information. The use of technology is becoming more widely-used as a tool for delivering off-site coaching support to instructional staff. Off-site technology can: remotely connect coaches and their practitioners; provide video examples of high quality teaching practices; and provide opportunities for teachers to view and reflect on their own teaching practices as well as learn from others’ critiques. 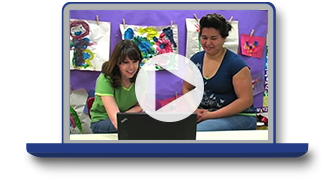 The Results Matter Video Library, produced by the Colorado Department of Education, is accessible for early childhood professionals to use for their professional development activities and offers brief video clips in seven broad topic areas including assessment and early intervention. Two videos in the long list of available options, Using Video for Reflection and Coaching at SD27J Preschool and Example of Using Video for Coaching at SD27J Preschool are focused on coaching and demonstrate how video can be used as the foundation for self-reflection and coaching. The complete list of videos in the Results Matter library can be found here. Coaching targets were identified either through staff self-identification of their coaching needs or from the coaches’ staff observations, and use of formal and informal assessments. The coaches perceived their roles as collaborative partners, providing emotional support and instruction. The staff perceived the coaches as assistants, advocates, and sources of emotional support. Coaches reported success with increasing staff openness to learning and improving the quality of practices. The staff reported changes in both instructional and behavioral management practices. Both the coaches and the staff reported that their relationships were supportive and open. "Another way our Coach is making a difference is with us as leaders. The Coach is guiding us in the direction of where we need to be with our curriculum. The Coach is looking very closely at the curriculum and dissecting the scope, sequence and the skills. The Coach lets us know what we need to do to supplement the curriculum and meet the needs of all of the children. This helps us make sure everyone is ready for Kindergarten." Mentoring, Coaching, Consultation, Advising, Technical Assistance — Just what are the differences? Early childhood professionals and programs benefit from varied types of on-site support to build adults’ practice, skills, and knowledge. While these approaches focus on similar goals, there are subtle differences between mentoring, coaching, consultation, technical assistance, and advising. 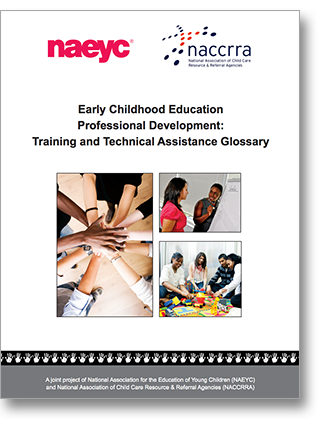 The National Association for the Education of Young Children (NAEYC) and the National Association for Child Care Referral Agencies (NACCRA) joined together to develop a glossary of professional development and technical assistance terms that define each of these types of learning supports, providing a definition and additional characteristics that include: focus, relationships, process, duration, and delivery. View the full document here. States are putting more effort into linking professional development and on-site support to improve quality in early childhood programs. This commitment, in turn, has led to an increasing number of coaches, mentors, and consultants, referred to by NAEYC (National Association for the Education of Young Children) as Technical Assistance Professionals (TAPS). NAEYC maintains a database, Policy Profiles for States and Territories: Early Childhood Education Technical Assistance Professionals, that shows the current status of state policies relating to TAPS using the six essential policy areas of NAEYC's Workforce Designs blueprint and NAEYC's report, Strategic Directions: Technical Assistance Professionals in State Early Childhood Professional Development Systems, found here. PDG TA has recently launched three new communities of practice: Dual Language Learners, Family Engagement, and Supporting Children with High Needs. To learn more or become a member, log on to PDGTA.org! If you are not already subscribed and are interested in receiving future issues of the PDG TA Quarterly Newsletter, please add your name and email to our subscription list by clicking the button below. responsive, timely, and high-quality technical assistance (TA) that supports each Preschool Development Grant (PDG) recipient’s successful implementation of its PDG projects. The PDG TA Program is run through a contract from the U.S. Department of Education in partnership with the U.S. Department of Health and Human Services’ Administration for Children and Families.